Scientists from the Nagoya Institute of Technology (NITech) in Japan have developed a sustainable method to neutralize carbon monoxide, the odorless poison produced by cars and home boilers. Their results were featured on the cover of the September issue of the journal, Nanomaterials. The key, according to Dr. Fuchigami, is ensuring the particles are highly complex but organized. A single, simple particle can oxidize carbon monoxide, but it will naturally join with other simple particles. Those simple particles compact together and lose their oxidation abilities, especially as temperatures rise in an engine or boiler. Catalytic nanoparticles with single nano-scale and complex three-dimensional (3D) structures can achieve both high structural stability and high catalytic activity, however, such nanoparticles are difficult to produce using conventional methods. Dr. Fuchigami and his team worked to control not only the size of the particles, but also how they assembled together. They used cobalt oxide nanoparticles, a noble metal alternative that can oxidize well but eventually presses together and becomes inactive. The researchers applied sulfate ions to formation process of the cobalt oxide particle. The sulfate ions grasp the particles, creating a chemically bonded bridge. Called a ligand, this bridge holds the nanoparticles together while also inhibiting the clumping growth that would lead to a loss of catalytic activity. The resulting particle looked like a raspberry: small cells bound together into something greater than the sum of its parts. “The phenomenon of crosslinking two substances has been formulated in the field of metal-organic framework research, but, as far as we can tell, this is the first report in oxide nanoparticles. The effects of bridging ligands on the formation of oxide nanoparticles, which will be helpful to establish a synthesis theory for complex 3D nanostructures,” Dr. Fuchigami said of the raspberry-shaped nanostructure. The unique surface nanostructure of the raspberry-shaped particles remained stable even under the harsh catalytic reaction process, improving the low-temperature CO oxidation activity. Dr. Fuchigami and his team will continue to study the bridging ligands with the goal of precisely controlling the design aspect of nanomaterials, such as the size and morphology. Ultimately, they plan to discover the most stable and active configuration for chemical catalysis and other applications. 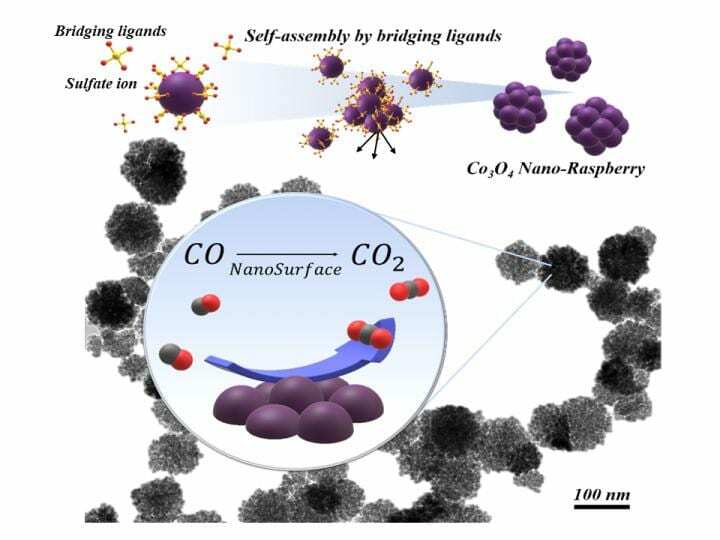 The article “Complex Three-Dimensional Co3O4 Nano-Raspberry: Highly Stable and Active Low-temperature CO Oxidation Catalyst” was published in Nanomaterials in DOI : 10.3390/nano8090662.